LiveU LU500: live video IP cellular newsgathering. 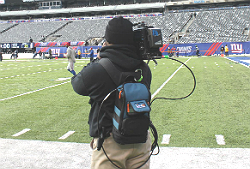 LiveU’s new smaller, stronger LU500 "takes the IP newsgathering market by storm"
Hackensack, NJ, March 2014 – LiveU (www.liveu.tv), the leader in portable live video acquisition, contribution and management solutions, has announced that the company’s new smaller, stronger LU500 has taken the market by storm. Positive feedback is flowing across social media from news camera people while hundreds of LiveU units have been deployed by broadcasters and news agencies to cover breaking news and major sports events, including the Sochi Winter Olympics. The LU500 benefits from LiveU’s proprietary antenna modules for greater resiliency and is powered by LiveU’s new multi-processor video encoding engine. Available in backpack or camera-mount configurations, the LU500 is integrated with the LiveU Central browser-based management system for easy control and geo-tracking of all LiveU systems, feeds, and apps from anywhere. The LU500 will support the new H.265 (HVEC) video codec for even greater resiliency and HD video quality, transmitted at half the bitrate. Once available, customers will be upgraded to the latest supported hardware. LiveU’s products achieved excellent results at the recent Sochi 2014 Winter Olympics with the new LU500 providing exceptionally high performance. Dozens of LiveU units were deployed by broadcasters and news agencies from around the world at any one time, supported by LiveU’s dedicated onsite team. The units transmitted over 500 hours using approximately 0.5TB of data with reporters sharing their excitement over Twitter. 2014 is a huge sporting year with the Winter Olympics having taken place and the FIFA World Cup™ in Brazil on the horizon. At the World Cup, LiveU will support hundreds of networks, stations, and online media from over 30 participating countries. LiveU and its partners will offer the full suite of solutions, as well as onsite, and dedicated, local support in the 12 host cities.